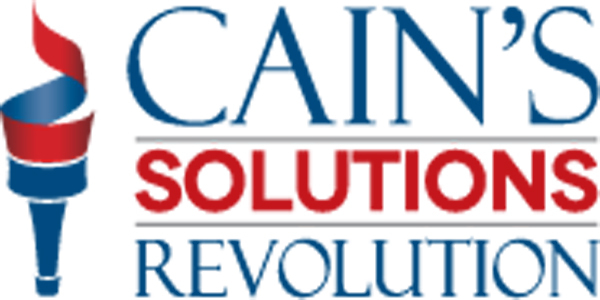 This past week, I participated in the Cain's Solutions Revolution on the Hill. Cain’s goal was to reunite the Tea Party leaders, grassroots activists of his campaign, and create a new Army of David’s to pound the street for free market reforms. Cain’s solution is an outreach of the Cain’s presidency, and while the focus of the Cain’s solution is his tax plan 9-9-9; Cain’s solution is not just about 9-9-9. Cain's solution is a well-connected economic plan that includes monetary reforms, energy development of our resources and regulatory reform with the idea of shrinking government and changing the relationship of Federal government to the people. In many ways, this is what a Ron Paul administration would actually look like but with a more active foreign policy and a peace through strength motif. 9-9-9 is the spear that propels the agenda and begins the process of reforming Washington. Cain states that his goal is to replace the present tax code with 9-9-9 with the final destination being a fair tax, and his tactics are simple. Raise an Army of activists in the hinterlands to promote his ideas and change the balance of power between the ruling class and people. Cain is proposing an outsider campaign with use of selected issues to lobby and change the present power structure. 9-9-9 is an interesting concept and not just for its simplicity. It broadens the tax base by lowering the business and personal income tax and adds a national sales tax. Cain’s theory could be that by having a national sales tax added to his plan, it would get people use to the idea of paying a sales tax on a national scale and make it easier to move to a Fair Tax system. However 9-9-9 is not a bad endpoint either since it does allow a broader base to collect taxes while ensuring that everyone pays as close to their fair share as any system could be designed. As Cain noted, Warren Buffet would actually pay 200 million dollars under his plan, far more than Mr. Buffet would pay under the Buffet rule or what he does presently. The 9-9-9 plan is one of those plans not designed by theoreticians or economists but by folks outside academician. Rich Lowrie and Herman Cain, the two men responsible for 9-9-9 are not academicians, but they are men who live in the real business world. Lowrie is a trained accountant and financial planner, who told me that he often viewed how government policies would affect selected businesses when making investment decisions. As he noted, “Businesses react to incentives and are affected by policies directed by Washington.” Lowrie, the accountant, and Cain, the business executive, developed a plan based on real world experiences. Cain's Solution is a haven for street wise folks who toiled in the hinterlands and understand both grassroots politics and how government decision affects Main Street. Linda Hansen and Mark Block, two of Cain’s closet advisors, cut their teeth on Wisconsin grassroots politics which can be rather brutal. Ms. Hansen has worked on developing free market learning units for workers in explaining how free markets benefit them, so she had her own experience in educating the grassroots. Beyond 9-9-9, Cain's Solution moves in a rather logical and straight forward matter. Cain understands that 9-9-9 is the first step and the most easily known but it also allows him to move from tax reformation to reformation of the whole economy. What Cain understands is that the economy is not just about debating taxes but the negative impact of excessive regulations on business, monetary policy and how easy money can rob the middle Class of their savings. Energy Independence can be described as drill baby drill and frack, baby, frack. It is an agenda that goes beyond 9-9-9. Cain states that he is for a “Solutions Revolution,” a revolution that fits his personality as a businessman who solves problems. While the free market conservative ideals are self-evident, he treats them as solutions not as ideology. He is marketing free market conservatism as he explains it to the people. Cain’s Solutions concentrate on economics and national defense and travels very little beyond that, but this strategy does have one advantage: it can attract a wider audience and in particular the younger generation who has seen nothing but failure over the past five years from the ruling class of both Parties. Cain has put his talent to work with a think tank run by businessmen and grass roots activists with experience in the real world and Main Street. In the process, he is helping to shape the conservative movement into the 21st century.